Interactive programming packages are provided for all CPU families. With the addition of PEmicro Windows based Debugger ( works with Assembler and C ) it can be used to debug code by providing downloading to memory, access to it and the registers, as well as having the ability to set breakpoints, run the CPU at full speed, slowly or in single step mode. Support for the Cyclone Max is being provided by a number of leading C compiler manufacturers within their C Debugging environment. This option provides 2Gbytes of additional memory images implemented using a compact Flash card (one included). 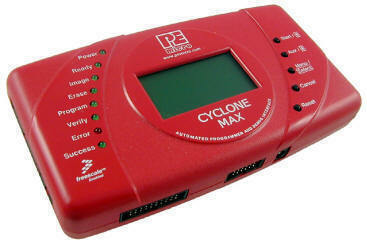 The Cyclone Flash option allows for faster, easier, and more flexible programming of data whether it is during field updates or on production runs.